Getting ready for spring, we've given our houses a big spring clean and have identified some products that we absolutely cannot be without this Easter weekend. From skincare to footwear, our wish list covers all the bases to ensure we confront Spring fully equipped. With my 23rd birthday coming up a couple weeks after Easter (April 20th if anyone was wondering..), I've got to admit that some of these items are also things I'd like in preparation for my birthday celebrations.. points to whoever guesses which ones! We've been longing for some of these palettes for ages and I cannot wait to have my hands on a few of them. 1. Since it's recent launch, I've been coveting this Makeup Revolution Palette. Fortune Favours the Brave is a triumph of a collaboration with the wonderful British Beauty Blogger whom we met at an event last year. The colours in this palette are just divine! It's hard to believe the palette is just £9.99! 2. I've been searching for a new handbag for ages and in the pile of 'unlikely' bags I will get lies this YSL beauty. If it were cheaper (much much cheaper) I would buy it, but bank balance unfortunately does not allow :(. Classic Small Sac Du Jour in Fog Grained Leather is just gorgeous but it comes with a hefty price tag of $2,890. Definitely for when I win the lottery. 3. I'm in dire need of a new statement necklace. Something to dress up a plain black dress or top and that's not too pricey (some amazing ones I've seen are £50+!). This piece from H&M ticks all my boxes; short, bold, silver, cheap. It has it all and is just £12.99. 4. Another palette Kirsty has been coveting. Tarte Cosmetics Tartelette in Bloom is just so pretty. She doesn't have any Tarte palettes yet but this is sure to be the first of many! 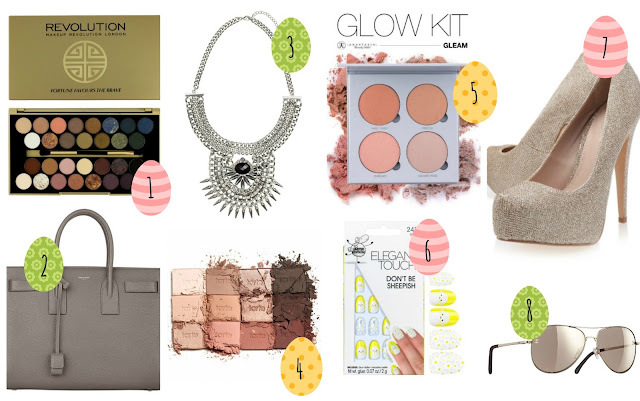 9 mattes and 3 lustres make this the most beaut palette for Easter. £33 and so worth it to have perfect subtle smoky eyes. 5. Kirsty is majorly eyeing the Anastasia Beverly Hills Glow Kit in Gleam. Having used their highlighters before and knows how good they are, she feels she just needs this palette to complete her collection as no others are comparable. 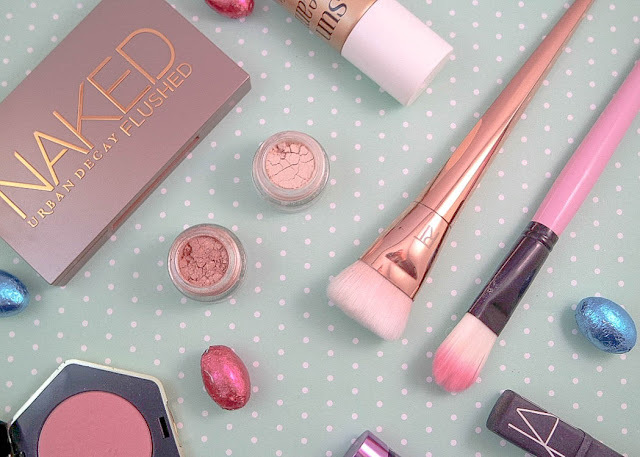 Convenient and beautiful at £39.00, you'll love having an amazing spring time glow. 6. My nails are going through an annoying phase of growing and then breaking, despite my best efforts to strengthen and take care of them. Nails from Elegant Touch are my saviours. Especially with the nail guards preventing damage to my nails. These Don't Be Sheepish* Easter themed nails are super cute and so appropriate for spring. Ewe can get your hands on these for just £6.95. 8. I love Aviator sunglasses above all other shapes and am always lusting after a designer pair. With the sun finally showing it's face, I'd usually go for Ray Bans, but I thought, as this is a wish list, not a shopping list, I thought I'd push the boundaries a bit and go for a Chanel pair. These pair of Pilot Signature sunnies will set you back $340. Other items to add to our wish list would be more YSL lipsticks, the Naked Palettes, Dior Dream skin and Marc Jacobs mascara. Hopefully over the next few months, we will in fact be fulfilling our wish list (unlikely for some items, but we can dream) so keep an eye out. Do you have any must-haves this Spring? Let us know!